From 1935-1950, instead of having previews, Paramount instead screened ten minute shorts before their theatrical releases: they called them Color Entertainment Shorts, and the Popular Science Cinema Series in particular was nominated for three Academy awards. 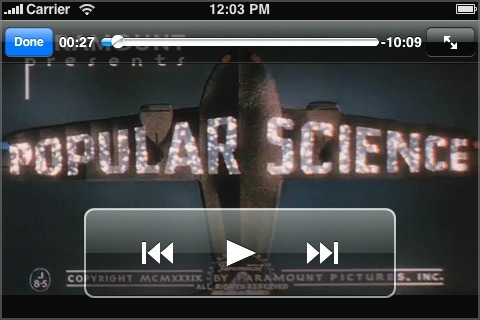 Popular Science also ran on TV throughout the 1990s, but thanks to Shields Pictures, is now available to you as an iPhone app. This app features episode three of Popular Science–which originally aired in 1938–as a download, meaning there’s no streaming involved. It has been remastered and restored from its original 35mm silver nitrate cinecolor film to high-definition digital. The film itself touches upon a school for seniors, remote-controlled U.S. Navy aerial targets, and pyrography, but the bulk of it is taken up by a tour of the Max Fleischer Animation Studios in Miami, Florida, giving us a glimpse of the fascinating process in making one of its biggest animated features, Popeye. Included in the app is a Photo Gallery of 10 unique photos from upcoming iShort releases, which you can save to your devices Photo Album. As someone who has studied the history of film and television, having this app is a pretty powerful thing–it’s like a slice of history, just sitting in my hand. You’d be hard-pressed to find this sort of medium outside of a film-and-television school or a museum, so to have it available to me for just $0.99 is kind of mind-blowing. It looks fantastic for its age and features very informative content; heck, even if you weren’t interested in the content, watching the iShort itself is amazing. I, for one, can’t wait to see all the other iShort releases. AppSafari review of Popular Science Popeye iShort was written by Julie Guan on May 21st, 2010 and categorized under App Store, Art, Education, Movies. Page viewed 4401 times, 1 so far today. Need help on using these apps? Please read the Help Page.